My superpower of choice? One-hundred percent perspective. It has the ability to make my heart full at lightning speed, fills my glass faster than the speed of light, and helps me solve crazy hard puzzles such as the definition of success. Ultimately it has, and always will, powerfully point me to the real joy in my life. This summer my superpower has led me to one of the single best experiences I have had thus far in my academic career – interning with okPORK. 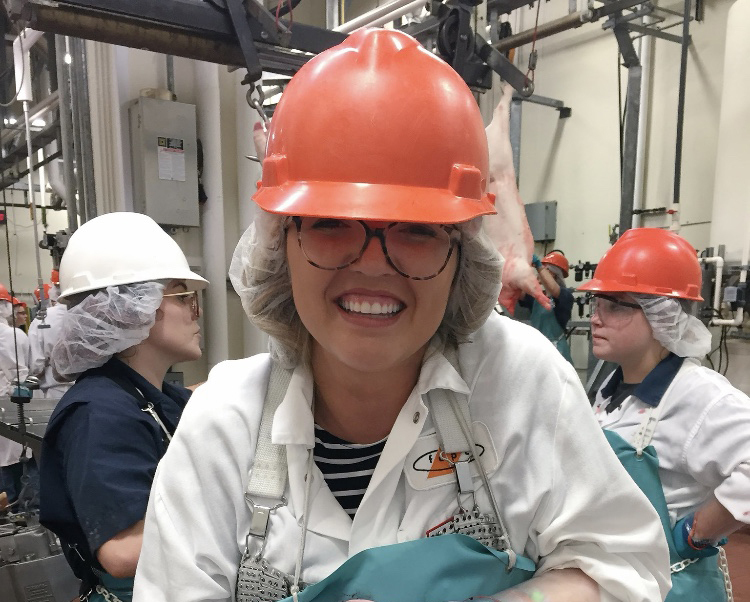 As an agricultural communications and animal science senior at Oklahoma State University, I figured my internship would entail the basics of working in the pork industry, doing some office work, and gaining some technical skills – boy was I wrong. Every morning I wake up to my alarm which lends me some motivation and tells me that I am “going to do big things today.” Then five very short minutes later my second alarm blares, and reads “make yourself proud, every single day.” I was so darn nervous. On my drive from Stillwater to Oklahoma City I carefully followed the directions on my phone, anxiously watching the clock, and singing to my most motivational Spotify playlist. Upon walking in the office, I can remember being greeted not only by the friendliest faces but also to flowers on my very own desk. From that point on I knew that my super power had led me to something great, and that my summer was literally going to be awesome. Being from Ohio, I wasn’t familiar with all the programs at okPORK. I had been told that okPORK is great at what they do. From then on, I knew I wanted to learn from the best, try my hand at promoting farmers and pork enthusiasts – which in my opinion are some of the best people on the planet. From day one I was quickly introduced to what would be my new normal for the next few months. Right off the bat I began to help plan for what would easily be my favorite event all summer, Youth Leadership Camp. I also was able to utilize some of my newly learned design skills to put together a logo and layout for okPORK’s e-newsletter, PORK PRESS. One of my favorite things about this internship is the fact that we are always promoting food, especially pork, which if you know me, you know food is near and dear to my heart. From spending some toasty days outside serving pork dishes to blood donors at the Oklahoma Blood Institute’s Annual Blood Drive to helping create Tasty-inspired pork recipe videos for consumers, there is no question we know what good food is here at okPORK. Getting to plan and help at okPORK’s Youth Leadership Camp was easily the highlight of my summer. Between meeting professionals in the industry to learning alongside twelve bright-eyed high school pork enthusiasts, my summer was easily made during that week span. Along my journey I have realized how much I enjoy capturing people’s stories and sharing them with others. I had the opportunity to create a “Day in the Life,” of a YLC camper who exhibited hogs at the National Junior Swine Association Summer Spectacular in Louisville, Kentucky as well. I have always known that I wanted to recognize people for the good they do in their everyday lives, but I didn’t know exactly how to – now I can do just that. I’ve been lucky enough to travel lots of miles this summer over the span of my internship. From Des Moines, Iowa, for World Pork Expo, to Phoenix, Arizona, for Ag. Media Summit, I’ve been all over the place to attend workshops, shows and conferences and become better informed about the industry. Day by day, no matter where my alarm was ringing one thing stayed constant. It always read to “do big things today,” and to “make yourself proud, every single day.” My goal this summer was to keep my positive perspective – I didn’t realize it would be this easy. In a short few months I will be finishing up my undergraduate degree at OSU and I will hopefully be in the process of obtaining my first real “big kid” job. From my experience this summer I would love to find a career where I have the ability to promote agriculture or the American farmer. Interning with okPORK has truly given me so many things to be thankful for. From learning to utilize my communications specific skills, to developing media material, to meeting some incredible agriculturalist and getting to know how the legislature works behind the scenes. I can’t thank the staff at okPORK enough for taking chance on me. This summer has taught me more than I could have ever imagined about anything and everything from farrowing houses to using an Osmo camera. Having been influenced by some incredible people, I’ve realized my opportunities are endless, as long as I have a goal and a willingness to pursue it. I am forever grateful.